I am not a chocolate person. I’ve mentioned this once before and offended a great many of you with that statement. My husband, on the other hand, is a chocoholic. So when special occasions come around, I always like to bake up a little chocolate treat to say I love you. This week we celebrated our third wedding anniversary. 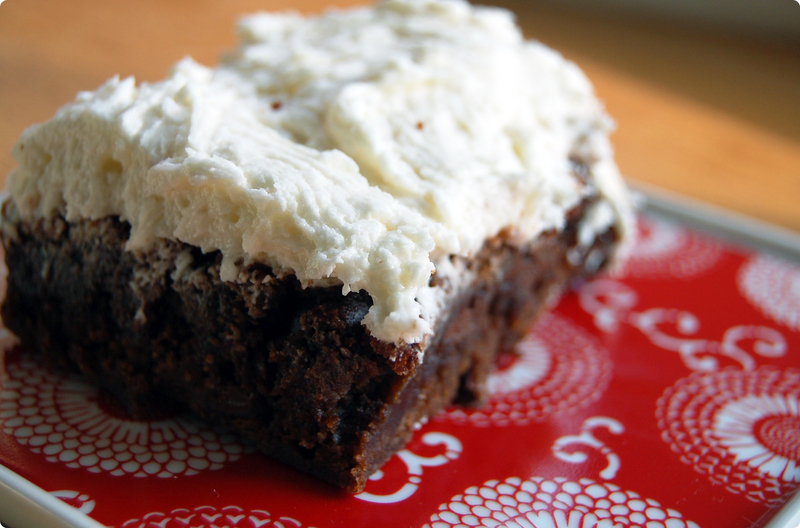 So on top of his traditional third anniversary leather gift, he was able to indulge in his favorite chocolate treat – chocolate brownies (or cake) with white icing. I’ve never baked brownies from scratch before, so I decided to give it a whirl. With a little help from America’s Test Kitchen, I adapted this recipe to suit my hubby’s palate and the baking items I had on hand. Preheat oven to 350. Grease a 9×13 inch baking pan. In a large sauce pan, boil water. Remove from heat and whisk in cocoa powder. Add unsweetened chocolate and stir until melted. Whisk in melted butter and oil. Add eggs, yolks and vanilla and continue to whisk. Whisk in sugar until fully incorporated. And flour and salt and mix with a wooden spoon or rubber spatula until combined. Fold in chocolate chips. Pour mixture into baking pan and bake for 35-40 minutes. Allow to cool. Cream butter in a stand mixer on medium high. Slowly add powdered sugar, 1/2 C at a time. Add vanilla. Drizzle milk and continue to beat until icing is at desired consistency. 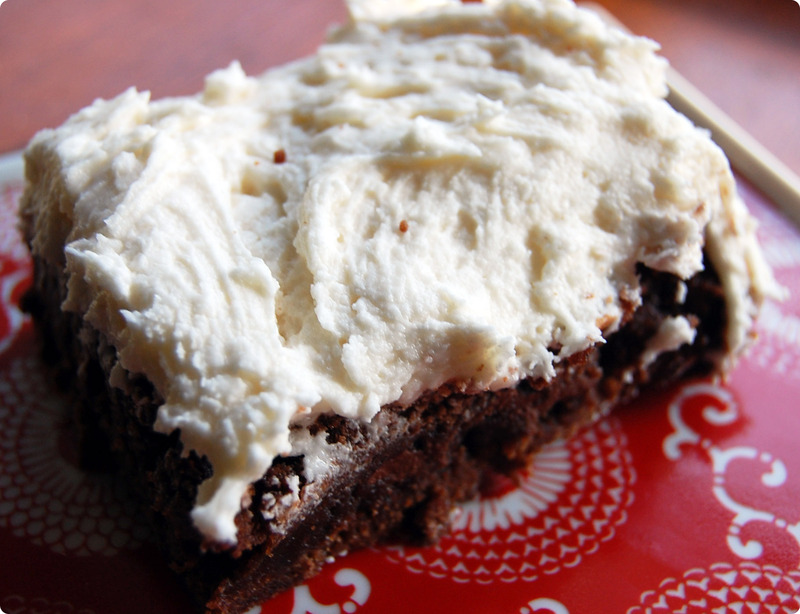 Spread icing on cooled brownies with small spatula. Cut and serve. These brownies don’t need the icing, but they add a little extra love. I asked my husband if he had any comments and he replied with, “Well….they are delicious.” So there you have it folks! 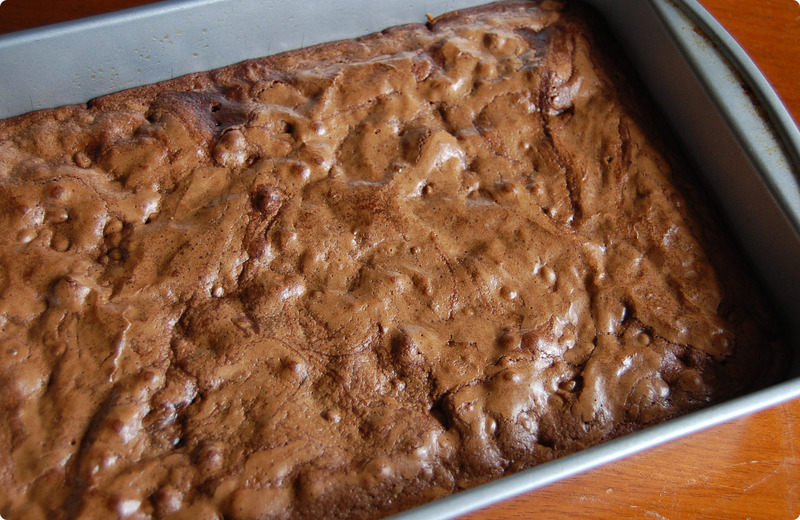 Delicious homemade brownies. I LOVE America’s Test Kitchen! These look fantastic, can’t wait to try them…perhaps this weekend! What a lovely wife you are! I sure wish I had the problem of not liking chocolate! 🙂 Happy Anniversary! Thanks Lisa! I added the recipe to your linky party. Thanks! I’m looking for a recipe to make this weekend and this looks very tempting! Happy anniversary, our 3 years are coming up in just a few months time too!